With such an important job you would think the government would maintain the highways and bridges these trucks depend on. The Interstate 75 (I-75) corridor is a major six to eight lane north-south Interstate Highway that runs from Florida through Georgia, Tennessee, Kentucky, Ohio, and up into Michigan to the Canadian border. The report from the Office of Highway Policy Information from August 2013 says upwards of 45,000 trucks pass through Kentucky and Ohio every day, all across one single 50-year old bridge. The Brent Spence Bridge opened in November 1963 between Covington, Kentucky and Cincinnati, Ohio and carries in excess of 200,000 vehicles every day. In spite of the huge volume of goods hauled by trucks across this vital north-south highway, nothing has been done to replace the overloaded bridge. The debate over replacing this bridge has been going on for many years with the states of Ohio and Kentucky unable to find the resources to pay for a billion-dollar replacement. The federal government has shown no interest in the project other then allocating 30-million dollars for various studies. To put things in perspective, the Barack Hussein Obama pro-Muslim Democrats in Washington have been spending trillions (trillions with a T) on rebuilding the entire infrastructures in Iraq and Afghanistan, that include new bridges, highways, and $545 million alone for 3 water treatment facilities plus new hospitals and electrical systems as well as constructing the new U.S. Embassies there that also included a billion-dollar fortress in Pakistan. That’s enough to pay for a thousand new bridges in America. If that wasn’t extravagant enough then the new decoration being installed in front of the embassy in Islamabad, Pakistan should get everyone’s attention, both for its misdirection, its cost and for its uselessness. Buzzfeed reports today: The State Department has purchased a $400,000 statue to be erected in front of the new billion-dollar U.S. Embassy in Islamabad. Islamabad, Pakistan, the hiding place of choice for Osama bin Laden and home of the most barbaric, Sharia-defending, anti-American Islamic population in the world is about to get a statue that should offend every Muslim. In case anyone missed the point, the statue of a Camel staring at the eye of a needle symbolizes a key parable from the Christian Holy Bible which should go a long way to please the Muslims who have been commanded by their prophet Mohammed to wage war and kill all of the Believers of the Book, i.e. Christians and Jews. The new embassy has been in construction since 2009 when Barack Hussein Obama ordered an increased American presence in Muslim countries. The previous U.S. embassy was burned down by enraged Muslims in 1979 all because of a false radio report. There has been no progress in improving Islamic-American relations over the ensuing years. They only hated us more after we killed Osama bin Laden. And it could hardly be expected coming from a country that will chop off the hand of any Christian who so much as touches a Qur’an. 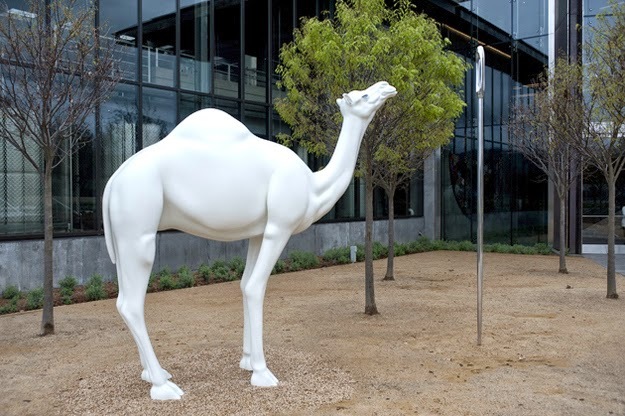 “Camel Contemplating Needle” by John Baldessari on display at the HALL Wines winery in Napa Valley, Calif.
An identical sculpture is planned for the U.S. Embassy in Pakistan. After Obama rebuilds the entire middle-east and bankrupts our own economy in the process, we won’t have any need for a new bridge across the Ohio River because there won’t be any traffic other than the Army tanks moving in to quell the revolution. Democrats are very good at starting wars, even at home.